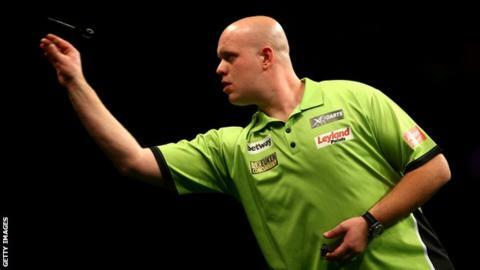 World number one Michael van Gerwen beat James Wade 18-12 to win his first World Matchplay title in Blackpool. Wade had ended Phil Taylor's 38-match winning run at the World Matchplay in the semi-finals. Before Saturday's defeat, 16-time world champion Taylor had claimed seven successive Matchplay titles and had not been beaten at the event since a semi-final loss to Terry Jenkins in 2007. "It's an honour to be in the final but I let myself down a little bit," said Aldershot's Wade, the 2007 champion. "From start to finish I struggled, and I wasn't good enough." The 32-year-old added: "I'm happy to be in the final and to mix it with the best players in the world again, but I'm not happy with how I played. "It's almost as if someone cut my arm off, and the most simple shots became hard work."